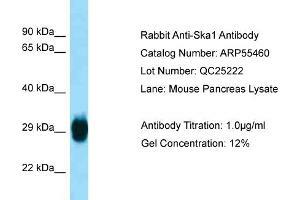 Characteristics This is a rabbit polyclonal antibody against Ska1. It was validated on Western Blot. Background Ska1 is a Component of the SKA1 complex, a microtubule-binding subcomplex of the outer kinetochore that is essential for proper chromosome segregation. It is required for timely anaphase onset during mitosis, when chromosomes undergo bipolar attachment on spindle microtubules leading to silencing of the spindle checkpoint. The SKA1 complex is a direct component of the kinetochore-microtubule interface and directly associates with microtubules as oligomeric assemblies. The complex facilitates the processive movement of microspheres along a microtubule in a depolymerization-coupled manner. In the complex, it mediates the interaction with microtubules.